Being in Venice, one of the most beautiful souvenirs you can buy is without doubt a Murano glass creation: from a bracelet to a chandelier or a statue, there is a hand-made work for every taste... and budget! 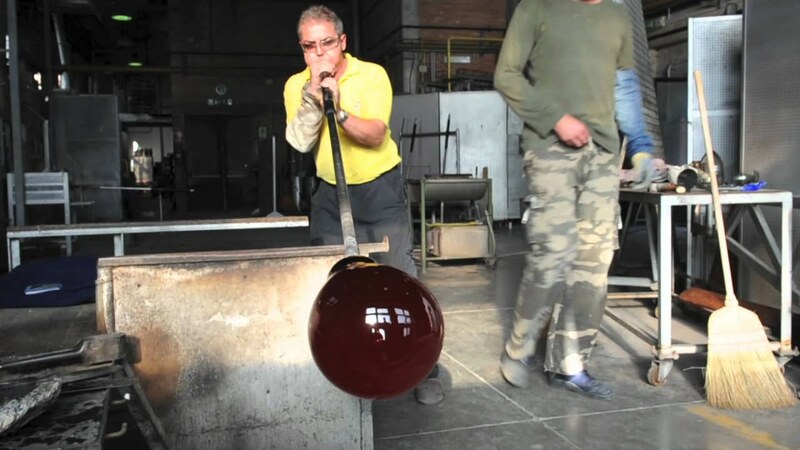 Let's discover something more about Murano, it's glass production process and glass-art objects. The Murano glass is one of the most precious glasses made in Italy. It is worked according to centuries old traditions, on the island of Murano, near Venice. The choice of this island was not random: Murano was outside the city centre, so any fire would not cause major damage (houses and ovens at the time were made of wood) and because it was located in the north respect to Venice, so the production fumes would not have reached the main city. The production of artistic glass for the city of Venice has always been an important industry. The oldest document available on the art of glass dates back to 982, but the first ovens were installed in Murano in 1291. Murano is an island located approximately 1 kilometer north of Venice. Murano is comprised of five islands and has about 4600 inhabitants. 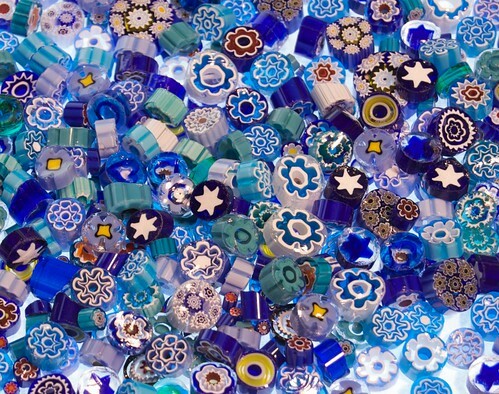 The main activity in Murano island is the production of artistic glass, (Murano is also called "the glass island"). In addition a main component of the island's economy is tourism. Murano has had always a relative independence from Venice, having its autonomous town hall till 1923. The ancient name of the island was Amuranium, which was given to her by the first refugees coming from Altino, in memory of a gate in their original town. In ancient times Murano island had several villas with gardens, palaces, churches and monasteries. Unfortunately many of those buildings have been destroyed. Murano island was at its best during the sixteenth century and had a council called "arengo" and its own "podestà" starting from 1272. The original families of Murano island were entered in a "golden book" which ensured them some privileges. The glass industry was moved from Venice to Murano in 1291 by decree of the Maggior Consiglio for two reasons: to avoid the continuos fires which were happening in the city caused by the furnaces, and being able to check the production. Manufacturing secrets were jealously handed down from father to son, and the "Serenissima" was forbidding the expatriation to the glazier-masters of Murano island to guarantee to itself the monopoly. The invention of glass blowing dates back to the first century BC on eastern shores of the Mediterranean Sea, and remains the most important event of the entire glassmaking history. Especially in Venice, blowing constituted the preferred technique used for high-level glassworks. Since Middle Ages the Murano masters have developed an extraordinary ability in the hot modelling, inventing new techniques and introducing forms of remarkable elegance and refinement. Among the techniques, the most important is watermark: the "retortoli" or the sixteenth century "reticello", creating the effect of a delicate lace inside of the glass wall. It is preferably made on colourless or slightly coloured crystal with two modes: "graffito a punta di diamante" or "incisione a Rotina". The first consists of a decorative light scratch, the latter is deeper and made with a small metal wheel. From the Middle Ages to the early eighteenth century the "cesendello" was the most polished lighting system in homes and churches: it was an elongated container, typically on ceiling, filled with water and a top layer of oil and provided of a wick. 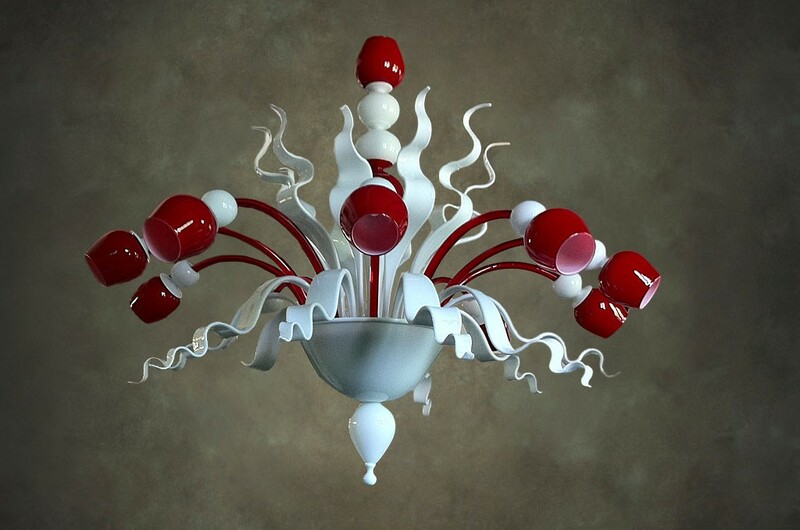 An important event, dating from the eighteenth century, is the birth of the "ciocca", the crystal chandelier with candle arms with element in blown glass and decorated with multicoloured glazed flowers and hanging elements: this chandelier still occupies a prominent position in the production of Murano. The simplest are the "conterie": beads round or with sharp edges, obtained by sectioning perforated narrow tubes pulled in the furnaces for a length of tens meters. The manual skill is exalted in the so-called "lavorazione a lume": a non drilled glass rod is softened by heat of the fire from a torch, subsequently wrapped around a metal tube, so as to give the pearl the desired shape and finally decorated with polychrome glass. An ancient technique prior to blowing, recovered in the nineteenth century, after almost two thousand years of disuse. It is the longest and most complex technique, consisting in the fusion in the oven heat of monochromatic tiles or sections of canes of polychrome glass according to a planned design, so as to obtain a coloured vitreous tissue. The technical difficulties related to the modelling of heavy masses of molten glass have been addressed since the thirties of the past century. Today, the sculptural art movement some of the most respected master of Murano belong to, occupies a key position in the field of glass production. Since Middle Ages tableware is a typical product of the Murano glassworks. Currently the most known designers cooperate with the glassmakers for the realisation of contemporary creations. In past centuries the glassy slabs manually produced in Murano (obtained by opening a blown cylinder) were processed in the Venetian mirror maker's workshops. The tradition has been preserved, and expert mirror craftsmen apply the most refined decorative techniques to match the quality of ancient artefacts. It is an ornamental painting performed with a material formed with the same components of the glass wall on which it is applied. Of Islamic and Byzantine origin, the art of enamel developed in Murano in the thirteenth century. That's a little bit of this interesting form of art, you can dive deeper in visiting one of the many glass workshops on the isle of Murano. Let me know your thoughts and experiences with the magical process of generation of Murano glass. As always, I wait for your comments below.